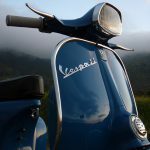 If in Italy you talk about scooters and motorcycles and you wonder what means can be the most characteristic, the answer is only one: LA VESPA! It was patented in 1946, it is one of the most famous industrial design products in the world and used several times as a symbol of Italian design. The origin of the name according to the most famous version was born from an exclamation of Enrico Piaggio who at the sight of the prototype exclaimed: “looks like a wasp!”, due to the sound of the engine and the shapes of the bodywork seen from above they resemble the insect, with the central part very large to accommodate the driver and the narrow “waist”. On the other hand, another version, long survived, according to which the term “Vespa” would be the acronym of Veicoli Economici Società Per Azioni – Economic Vehicles for Equities – (indeed Piaggio was one of the first joint stock companies in Italy and, at the same time, Vespa was born as a vehicle for everyone, so of primary importance it was a low price, suited to the characteristics of the era). This hypothesis has been denied by the various experts of the vehicle. Over the years obviously the design of the Vespa has undergone various changes and improvements. Nowadays, in Florence are offered various trips on the hills of Chianti on board this nice hog: these tours will take you into the heart of the countryside a short distance from the city, where you will sail the gentle Florentine hills surrounded by scenic landscape. Do not worry about driving: the wasps are very easy to drive and if you do not feel safe, you can always travel as passengers! Definitely an experience not to be missed!